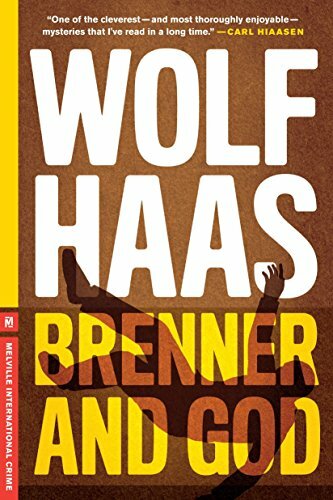 And so begins Wolf Haas’ darkly humorous Brenner and God, the first of the critically acclaimed Brenner novels to be published in English. Simon Brenner is an ex-detective who has turned to a quieter career as the personal chauffeur for two-year-old Helena Kressdorf, the daughter of a Munich construction giant and a Viennese abortion doctor. Brenner believes it’s the perfect job, providing everything he needs. But that’s all about to change drastically. One day at the gas station, while Brenner’s attention is turned to picking out a chocolate bar for Helena, the little girl gets snatched from the car. Eventually cleared, but fired by the Kressdorf, Brenner is now out of a job; however, he decides to investigate the child’s kidnapping on his own, regardless of the danger. With both parents in the public eye, there’s no scarcity of leads or suspects—the father’s latest development project has spurred public protest; and an anti-abortion group, lead by another suspect, Sebastian Knoll, is constantly targeting the mother’s clinic. Throughout the book, Brenner makes his unholy way through a powerful cast of characters and an increasing pile of bodies to solve the crime in the only way he knows how: by being in precisely the right place at the worse possible time. His bloody journey will not leave him unscathed. . . .
Simon Brenner is a classic noir detective/investigator, who takes his knocks and broken bones along with anything else life decides to send in his direction. Think “Columbo” meets “The Rockford Files.” He has been brilliantly brought to life by Mr. Haas’ subtle yet masterful prose, with just the right balance of dark humor. Publisher Melville House is to be commended for translating the Brenner series into English and bringing it to a wider audience. Mr. Haas may not yet be a household name, this side of the Atlantic, but all that is about to change thanks to Simon Brenner.